The celebration of Queen Elizabeth’s Diamond Jubilee reminds me of something my Scottish grandmother once shared with me. I asked her to tell me her earliest memory a historical event. 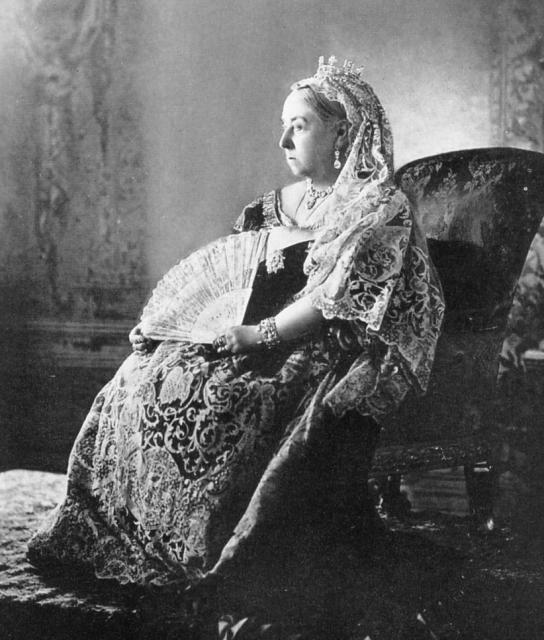 She thought for a minute and said it was Queen Victoria’s Diamond Jubilee in 1897. She was seven years old and saw a fancy display of decorated cakes for the Jubilee, complete with flags, ribbons and a big picture of the Queen, in a bakery shop window in Aberdeen. She said she had only been vaguely aware of the Queen before seeing this impressive display. I was only a child myself when we had this conversation, and I was surprised to realize that my own grandmother could remember Queen Victoria, who I thought of as a figure from ancient history. It still thrills me a bit to think I knew someone who knew Queen Victoria, even though she only knew her through a window display. She also remembered another display in that same bakery window. It was dedicated to the Klondike Gold Rush, with little prospector figures and lots of fluffy cream and gleaming sugar representing snow. She described these scenes to me in great detail — I wonder if whoever did those window displays knew how lovingly his or her work would be appreciated and remembered! But this was a time before movie theaters and television, and poor families like my grandmother’s couldn’t afford to visit museums or to buy newspapers, magazines or books, so these shop windows must have truly been windows to the world for my grandmother. When are we having our Jubilee party?